Pictured are Kurt Muncy’s fiance, Jackie Christopher, his father Buddy and mother Carol at the ribbon cutting for the memorial park. On the second anniversary of the death of Kurt Muncy, a former Preble County and City of Eaton law enforcement officer, a dedication ceremony was held in his honor. 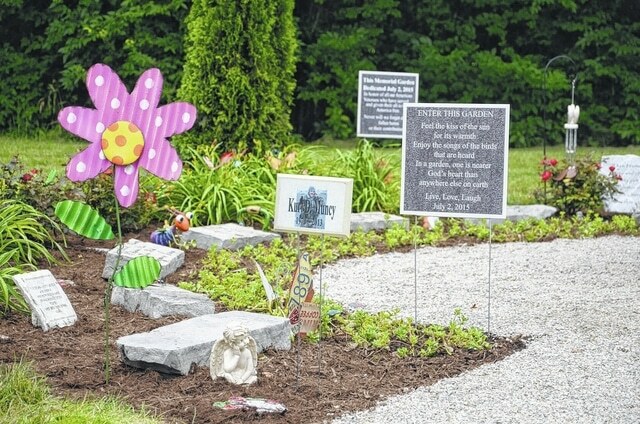 Muncy’s fiancé, Jackie Christopher, designed the Kurt Muncy Veterans Memorial Garden, which is dedicated to Muncy and in memory of other veterans. The park is located at the Preble County Council on Aging Senior Center. EATON — On the second anniversary of the death of Kurt Muncy, a former Preble County and City of Eaton Law Enforcement Officer, a dedication ceremony was held in his honor. Muncy’s fiancé, Jackie Christopher, designed the Kurt Muncy Veterans Memorial Garden, which is dedicated to Muncy and in memory of other veterans. The brief ceremony, which was held at the Preble County Senior Center where the garden is located, was attended by his family, friends, co-workers and law enforcement officers. “When I thought about this garden it was a multi-fold purpose and I know Carol (Kurt’s mother) was always worried that Kurt was going to be one of those that we all knew him, we went to school with him, we grew up with him, even worked with him, and that people would forget him,” Christopher said. Two years ago, on July 2, 2013, Muncy was killed in a suicide bombing while working as a private contractor training Afghani officers. Muncy had taken a voluntary leave from the Preble County Sheriff’s Office when the county was going through financial troubles, so a friend who had kids could keep his job, according to his father Buddy. He had recently been home to celebrate his parents’ 50th wedding anniversary, which he helped plan with his brother Jeff, just days before the bombing. The day Kurt returned to Kabul, he was one of a dozen people killed. Kurt was a 1989 graduate of Eaton High School and attended the police academy. In addition to working for the EPD and PCSO, he was a former police officer with the West Alexandria Police Department before becoming a contractor for DynCorp International in Falls Church, Virginia and was serving in Kabul with the Afghan National Police Development Team at the time of his death. Christopher said she hopes the garden is a place where Carol can go and visit and that Buddy can see on a daily basis.